You’ll spend most of the time trying to build up characters for the impossible last stage quest. I’ve done this a few times, and immediatly everyone dies from heart attacks. Yeah. Heart attacks. It’s just too scary. What the game makes up for in art, concept, economy, and RPG D&D feel, is forever lost to a very imbalanced and lackluster engine. Now too play Doom 3. Wanted to like it, but it grinds on forever. 2/5 stars. “More ashes, dust, and disappointment.” A line from the fantastic narrator in the game. 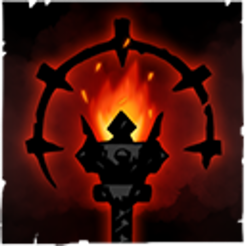 And as much as I wanted to like Darkest Dungeon, I couldn’t help but feel exactly that. Disappointment. 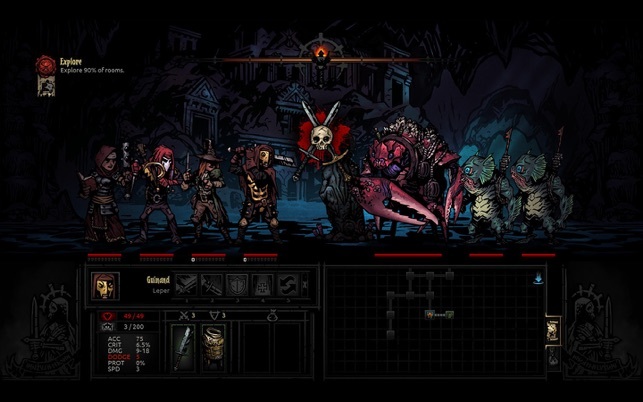 After about 10 hours playing it’s clear that the game is meant to be trapped in a cycle of massive party death and repeating low level quests, which end up all feeling the same. It wasn’t thrilling fear or nerve-tingling suspense I was feeling when the now familiar narrator’s voice extoled in detail just how inadequate my party was…it was boredom. And that’s a shame because there is a lot to like about the game’s aesthetics, art direction, minimalism, and depth of character building. However, all that pales in comparison to that fact that it’s practically unplayable. Sure, the first few times you have a total-party-kill or a character succumbs to madness there’s a bit of a masochistic thrill, but by the 6th and 7th time I was totally done with the game. I figured I’d pick it up again after a few days and give it another chance. Nope, still boring. I feel like with the music and art direction and the tone it shouldn’t be, but in actualy play it’s a weepingly boring game. I’m sorry to say this was not worth the $24 spent on it. 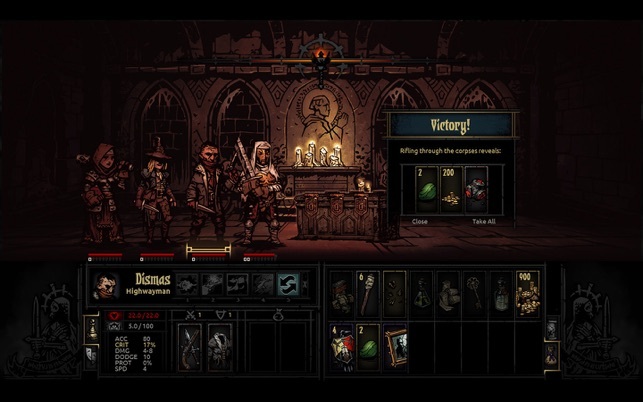 Unless you like games with no reward or hope of beating them, savoring the masochism of grinding again and again as your party dies for no real purpose, I wouldn’t recommend Darkest Dungeon. This is exactly what I wanted. 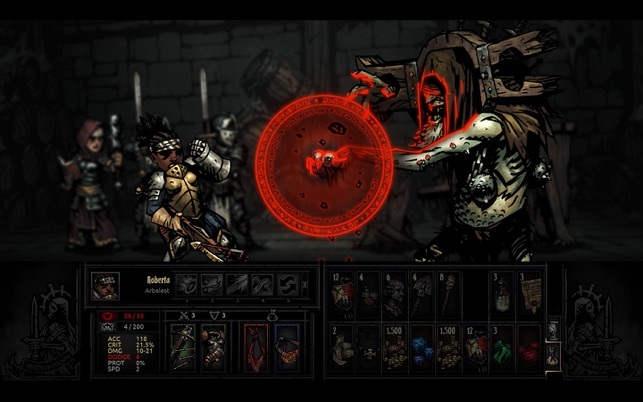 Slow punishing dungeon crawls, full of flavor and fantastic art. I’m sure it’ll be brutal my first time through, but these types of games are my favorite. For anyone concerned, it runs exceptionally well on a 2012 Macbook Air without kicking on the fan or tinkering with default settings. 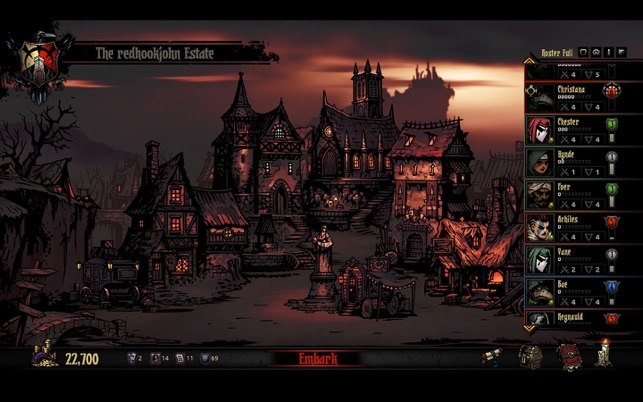 Thank you to the people at Red Hook for delivering on not only a successful kickstarter, but a truly great game. © 2015-2017 Red Hook Studios Inc.